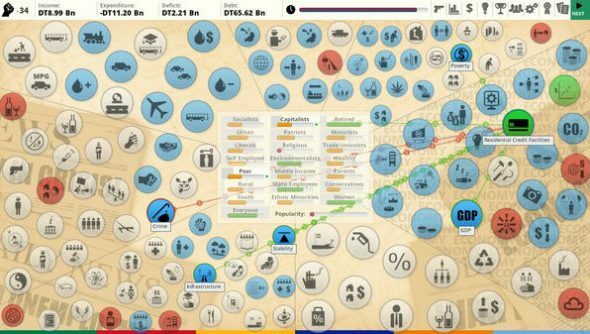 Democracy 3: Africa is still the icon-based political strategy you remember, but this one takes you to the birthplace of man, the center of the Earth’s landmass, and the continent that houses 22% of the world’s entire population. It’s probably going to be a bit tricky to manage. In Democracy 3, the ideals of the citizens were Westernised, but Africa changes that up, with religion playing a more prominent role, along with issues like racial persecution. This standalone reimagining of the hit political strategy, is available to buy now on Steam ordirect from the developersfor $14.99. In Democracy 3 foreign aid often comes with strings attached, and you’ll have to tackle serious issues like access to clean water and malnutrition across all new countries: Nigeria, Egypt, South Africa, Kenya, Ghana, Zambia, Senegal, Tunisia, Botswana and Mauritius. The game is still built around the core of Democracy 3, but this standalone expansion comes withnew artwork and music, along with series of new events and dilemmas specific to Africa. “Bloody liberals,” laments Cliff upon realising that no one wants to vote for him. Despite him forcing the issue about through some less than happy-clappy means. South Africa’s literacy rate is through the roof under his guidance, but it’ll all be for naught if the ballot papers don’t go his way. Cliff takes on Egypt in this third instalment, pushing an environmentalist agenda while letting a few other social issues bubble away in the background. It’s a maverick approach to a tricky north African game proposition. In the fourth dev diary, Cliffski tries to fix the economic and social problems of Botswana in a single electoral term. Will he put an end to the general strike and cure the country of malaria? or will the people throw him out in a rage? Next, it’s Kenya’s turn to have its problems solved. While gender inequality takes leaps and bounds forwards, that good work doesn’t result in a particularly robust economy. Finally, Zambia goes under the spotlight and Cliff gets in a spot of bother with the country’s farmers. Collateral damage for solving all the nation’s problems in one electoral term. The diaries demonstrate the particular challenges of each region and nation – and the impact a little fiddle with a single slider can have on that nation. If you’ve watched those videos and reckon you can do better, the game’s available as a standalone as of… right now, actually. Grab Democracy 3: Africa here.